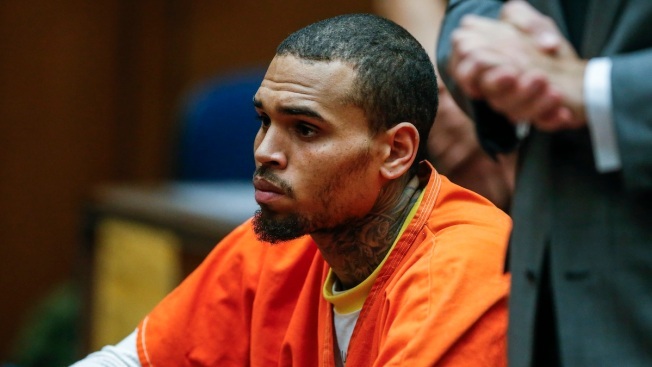 Singer Chris Brown's Bodyguard on Trial in D.C.
A lawyer says the man who claims he was punched by Chris Brown and his bodyguard is trying to "get rich" as a result of a bloody nose. Bernard Grimm made the statements at a trial in D.C. for his client, bodyguard Christopher Hollosy, who is charged with misdemeanor assault. Hollosy's trial began Thursday in Superior Court. Brown and Hollosy were arrested in October after a 20-year-old Beltsville, Md., man accused them of punching him outside the W Hotel near the White House. Hollosy told police he punched the man after he tried to get on Brown's tour bus. The man told police a different story. He said Brown and later Hollosy punched him because he tried to get in a photo Brown was taking with the man's girfriend and another female friend. The prosecution said Brown and Hollosy hit the man with back-to-back punches, injuring his face and breaking his nose. The victim, his girlfriend and a limo driver all testified Thursday that Brown threw punches during the incident. However, on cross-examination, the limo driver said he saw Brown throw a punch that grazed the victim's shoulder. He said he then saw Hollosy throw a punch that resulted in blood. The victim's girlfriend, however, testified that she didn't see the bodyguard punch anyone. A police officer who responded to the scene also testified Thursday before the proscecution rested. The defense then made a motion to acquit, which the judge is expected to rule on Friday. If the judge does not accept the motion, the defense will call its witnesses. At the time of the alleged assault in D.C., Brown was on probation in California for a 2009 attack on singer Rihanna, his then-girlfriend. Soon after his arrest in D.C., he entered rehab for anger management treatment, but was jailed in mid-March after violating the treatment facility's rules. If convicted in the D.C. case, Brown could face additional penalties, including time behind bars, under the terms of a court order in the Rihanna case. Last week, a judge ordered that Brown and Hollosy be tried separately. Brown's trial will begin after Hollosy's ends. Both cases will be decided by a judge, not a jury. Hollosy's trial is expected to last about one more day. A civil case is also in the works. The victim is suing for $3 million for doctors' bills, pain and suffering. The defense said the victim provoked the fight and now just wants to make money.